I recently found myself in a conversation with a bunch of moms about proprioceptive dysfunction and the best proprioceptive exercises for sensory seekers, and I felt more than a little lost. My understanding of the proprioceptive system is spotty at best, and while I’ve done a ton of research about sensory integration activities for autism and sensory processing disorder over the last several months, my focus has always been on finding fun vestibular system exercises (see my favorites HERE). And even though the proprioceptive system is closely related to the vestibular system, they are still 2 very separate senses. So I started poking around on the internet and thanks to all of the wonderful occupational therapists who so graciously share all of their best sensory integration techniques for kids, I found some pretty amazing proprioceptive exercises to help children with sensory processing disorder. But before we get to those, let’s lay a little groundwork, shall we? Simply put, proprioception is about body position and awareness. The proprioceptive system is responsible for helping us understand where we are in relation to the space around us. Our proprioceptive receptors exist in our muscles, joints, and ligaments, and these receptors are what enable us to sit, stand, stretch, bend over, climb stairs, run…you get the idea. Proprioceptive dysfunction occurs when we aren’t receiving and processing information from our proprioceptive system correctly. This can present in one of 2 ways – proprioceptive seeking behaviors or proprioceptive avoiding behaviors. What fascinated me most while reading about the proprioceptive system and researching fun proprioceptive exercises for kids was the effects proprioceptive dysfunction can have on a child’s development. I had no idea challenges with proprioception can have such wide-spread implications, particularly in the classroom. I didn’t realize that a child with proprioceptive dysfunction can have trouble focusing and sitting still, that she might avoid certain activities, tire easily, and have trouble with self-confidence, but now that I have a better understanding of sensory integration as a whole, I have a greater appreciation for those who struggle with sensory processing disorder. One of the best ways to help children develop is to find activities that feel like play instead of practice, and this collection of proprioceptive exercises (aka ‘heavy work’ activities) will allow you to do just that. Be mindful of how your child reacts to each activity and back-off if she finds them too scary or overwhelming, and make sure to speak with a professional to ensure you are choosing proprioceptive exercises that are appropriate for your child’s challenges and developmental goals. A lot of these activities offer age-appropriate ways to get your little one to help out around the house, and since a little responsibility can go a long way in making a child feel as though they are a contributing part of the family, which subsequently helps to build their self-esteem and self-confidence, these ideas are a win-win in my books! Playing jump rope fun – I love these jump rope songs and this light up jump rope is pretty cool! Go all out and install one of these indoor gyms for kids in your basement! Wrap your child snuggly in a blanket and pretend she’s a burrito! *Make sure to follow directions when ordering weight products to ensure the weight is correct for your child’s age and size. For safety reasons, your child must be able to remove the item from her body herself. 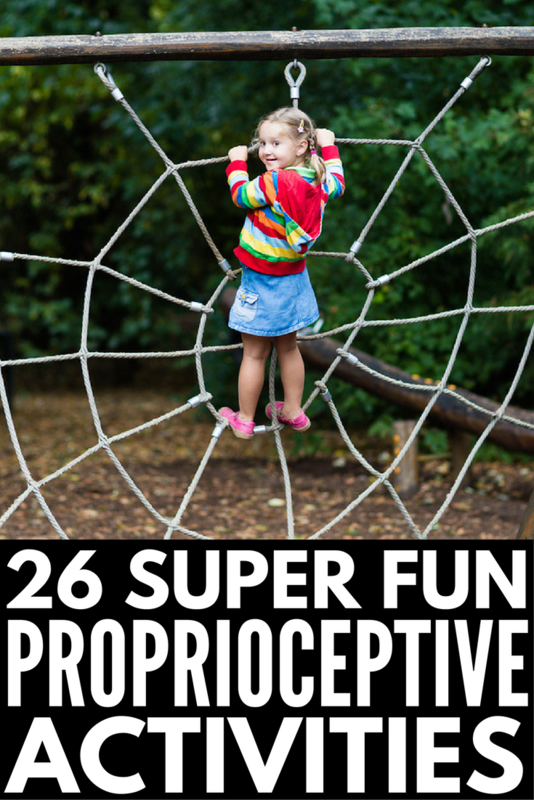 I hope you found this collection of proprioceptive exercises for kids helpful, and that they gave you the knowledge and inspiration you need to find ways to turn practice into play both at home and in the classroom! If you liked this collection of proprioceptive exercises for kids, please share this post on Pinterest! And if you’re looking for more advice to help kids with autism and sensory processing disorder, please follow our Autism board, where we share all kinds of great ideas!